“Do you believe in miracles?” That’s what Al Michaels asked in the closing seconds of the 1980 Olympic semifinal game between the U.S. and the U.S.S.R. It would be the first time in 20 years that anyone had beaten the Soviet team on the ice. Now, almost 25 years later, Miracle tells the story from coach Herb Brooks’ point of view. 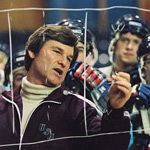 Brooks (played by Kurt Russell and his hair), a college coach from Minnesota, interviews for the Olympic coaching job. He has definite ideas about how to beat the Russians — playing looser and more creatively. His ideas don’t jibe with the committee’s plans, but later, back in his suburban Minnesota home, Herb gets The Call. What the committee had wanted was an all-star team. The best amateur players from across the U.S. would be recruited to play in the Olympics. But Herb has a more communal approach. He wants a team of players who work well together, and not necessarily individual stars. Miracle finds drama in assembling the team, making cuts, the rigors of training, and the marital problems between an overworked husband and an underappreciated wife and mother. Some of these conflicts are interesting, like deciding which player to cut to get the team down to 20. Others, like the domestic squabbles between Herb and his wife (Patricia Clarkson), add almost nothing to the movie. Before the movie’s emotional climax, one scene does stand out. After tying an exhibition game with Norway, Herb becomes a raving monster. He makes his team work out until they’re drop-dead tired, then he works them some more. The scene adds a seriousness that keeps Miracle from being too candy-coated, although it’s still a pretty sweet-tasting concoction. Overall, Miracle is little more than a feel-good sports movie, but if you like that sort of thing, it isn’t too bad. Even though we know the outcome of the big game, the movie builds drama and tension throughout. Some of the on-ice photography is pretty effective, too. The camera skates around with all the access of a referee, picking out the action with expert eyes. You won’t see the big picture, but you will feel the excitement of the game. But there is another dimension to the “Miracle on Ice” game. Many Americans saw the victory as a sort of stand-in for the Cold War. “Beat those commie bastards” is a telegram one Texas fan sent to Brooks. And it’s a safe bet that more Americans remember beating the Soviets in the semifinals than beating Finland in the Gold Medal round. The question on my mind, even before I saw the movie, was “why now?” Probably Disney is tapping into the same post-9-11 zeitgeist that caused Americans to put flags on our cars, in our windows, and on our porches. 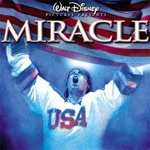 While the emotion of Miracle resonates in 2004, the game it portrays makes for a pretty bad metaphor. The Soviet Union has broken apart into Russia plus a handful of Eastern European and Asian states, and America’s new enemies aren’t organized enough or legitimate enough to field a hockey team. Also, in world hockey in 1980, America was the underdog. Nowadays, it’s hard to imagine America as an underdog in any sphere, politically, athletically, or culturally. In one sense, that’s too bad, because America loves to root for the underdog. As Russell narrates over the movie’s end, after this, America started allowing professional athletes to participate in the Olympics. We started fielding “dream teams” that win ridiculously lopsided games, like the 1992 U.S. Olympic basketball team that beat Angola 116 to 48.